To feel at home is a basic human need. Our brains constantly work to assimilate our experiences into a gestalt of belonging, seeking a sense of place for our bodies, a connection to a collective cultural memory. We seek refuge from estrangement. Argentinian artist Luz Peuscovich is no stranger to being a stranger. Her site specific, indigenously informed structural installations have taken her from her home in Tandil to Brazil, Greece, Germany, New York, and now to our very own Newark, New Jersey. In a sense, the challenge of an international artist is to create something familiar in a strange place, yet strange to those familiar; something locally relatable and yet perceptually dislocated enough to provoke curiosity and investigation. Peuscovich approaches this disorienting dis-locality by immersing herself in each given culture as if reconstructing it from scratch, erecting a pseudo-shelter inspired by cultural traditions and collective memories, constructed entirely with locally gathered materials. Genuine in her otherness, she becomes no less earnestly indigenous through this process of acclimation and appropriation. The result is at once local and exotic, familiar and alien. 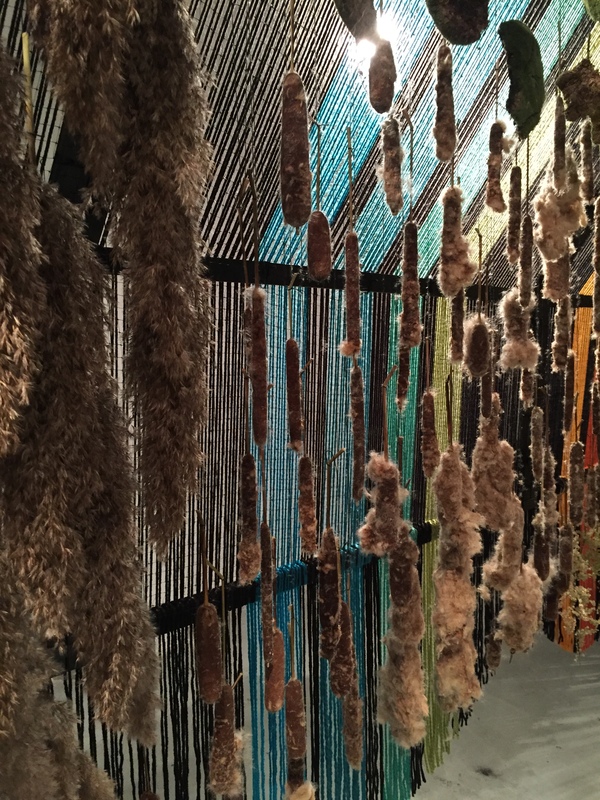 Upon arriving for her residency at Solo(s) Project House, Peuscovich and a team of assistants spent weeks foraging for plants, fibers, feathers, and other materials while sifting through native histories and practices. Out of this, Peuscovich feverishly and meticulously constructed her “Wigwam,” a sort of longhouse style Native Americanesque dwelling. 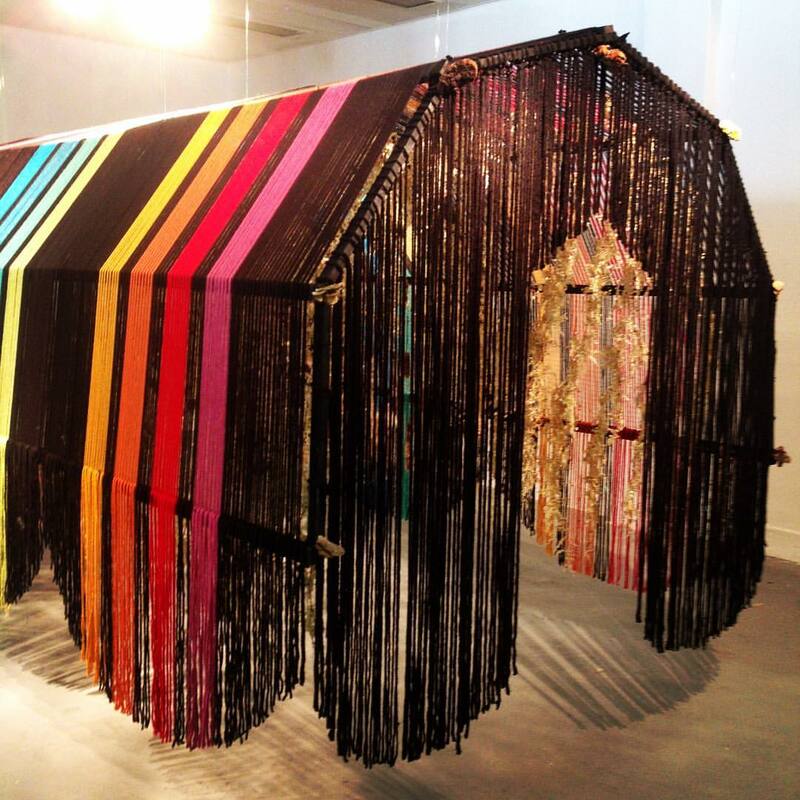 The wooden frame is open on both ends and thatched (or rather hatched, in drawing terms) with rows of colored string, adorned with plants and other collected materials dangling down from the roof at head height as if hung to dry. It’s almost hard to identify the materials as our own, as they become so strange and foreign seeming. The installation begs passage. Viewers are invited to walk through the wigwam, dwelling for as long as they please, taking in the myriad textures, colors, smells, and sounds (with what seems to be Native American music playing in the background) before being pulled onward by the inertia of the hallway-like interior. It’s a feeling perhaps indicative of the artist’s own passing through, dwelling as one of the locals for a time but being pulled ever onward. It is liminal, transitional, fleeting; comforting, yet dislocated. 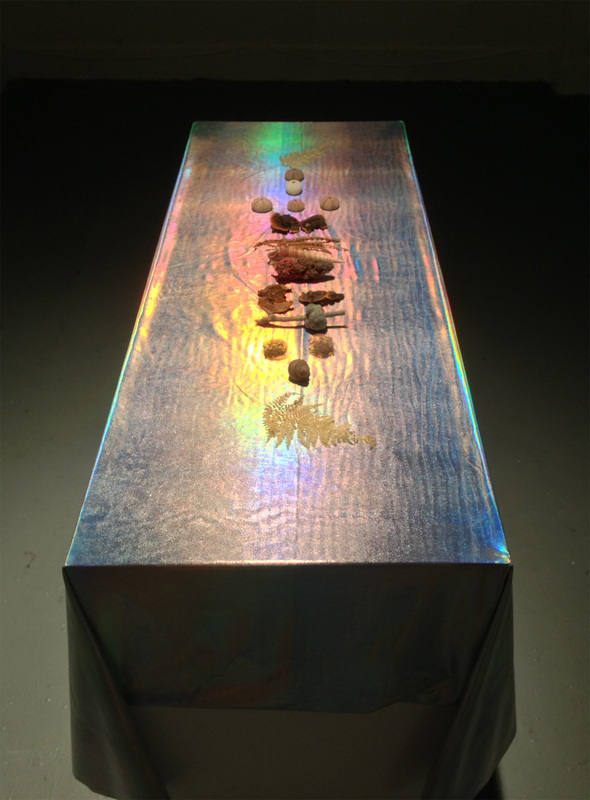 In another act of dislocation, removed off to the side of the gallery stands the “dinner table,” a rectangular surface draped with a white/rainbow holographic fabric. Tokens from Peuscovich’s world travels – shells, dried plants, rocks – sit atop as if all her past shelters had brought something of an offering to share at the table. The iridescent colors shifting on the surface of the table harken to Peuscovich’s previous shelters, often integrating light and color projections into her installations. This exploration of color surely owes to her background as a painter, and it reinforces the inertial feeling of passage and transition created in the Wigwam interior. Rather than settling down for a meal, the viewer is compelled to keep moving about the table, exploring the changing colors and linear, processional arrangement of items. After all, there are no chairs at this dinner table, as it urges us to admire, take part, but keep moving. The colored strings lining the exterior of the wigwam do much the same thing, organized sequentially into a full spectrum running from stripes of red to violet around the perimeter of the structure. 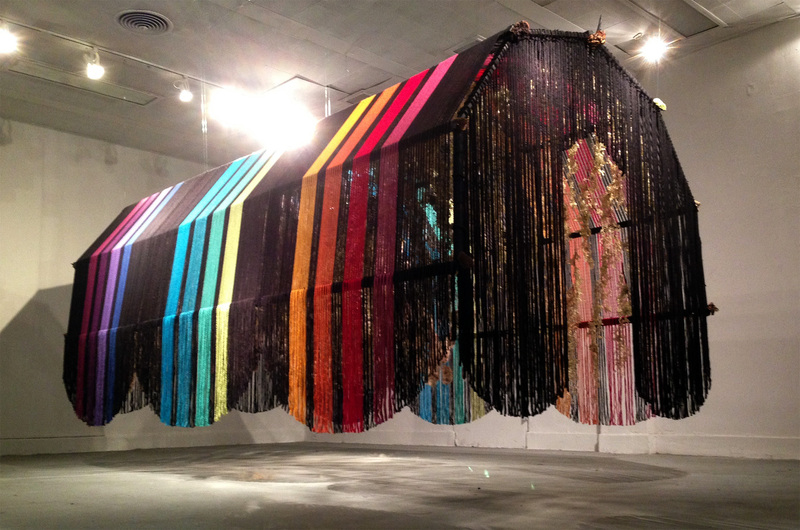 The colored strings incline the viewer to circumambulate. Inside and out it’s not an unwelcoming feeling, but one that resists the stasis one might expect of a dwelling place. In fact, the very first step in building any structure should be one of stasis, preparing the foundation and anchoring the framework to the ground. And yet, Peuscovich’s structure is without anchor. As with many of her shelters, Wigwam floats untethered above the ground, a spectre of its referent. It belongs nowhere else, yet nowhere at all. In traditional Lenni Lenape culture – the indigenous people of New Jersey – wigwams of this shape would often be used for healing rituals. Perhaps in the midst of constant flux and transition, torn between site and non-site, community and individuality, Peuscovich’s Wigwam offers a shamanistic healing of otherness. Luz Peuscovich Interview, english subtitles coming soon!